The seasons are changing and so are our Salad Bar Dinner Deals! 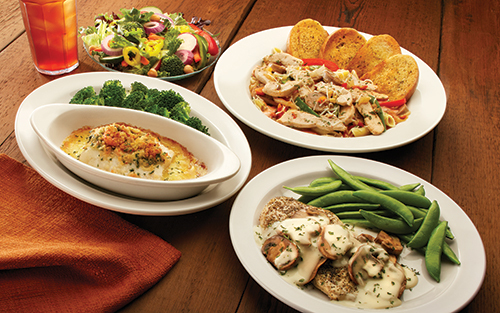 Available from 4-9 PM, these five delicious dinners all include our endless Soup, Salad & Fruit Bar for only $10.99! Read on to learn more about our new featured items. A returning favorite to our menu, this dish boasts grilled chicken breast, Italian sausage, onions and bell peppers, tossed with locally made Portogallo Pepper blend over penne. We serve it with our tomato cream sauce and Asiago cheese. Plus, it comes with garlic toast and our Soup, Salad & Fruit Bar! One of our all-time guest favorites! We feature our oven-baked cod that’s stuffed with our homemade blend of crabmeat, shrimp, spinach, onions, cheddar cheese, and cracker crumbs. It’s served with your choice of one side, bakery-fresh rolls, and our Soup, Salad & Fruit Bar. This delicious gluten-friendly selection includes tender boneless chicken breast that's seasoned with rosemary and black pepper, then topped with sautéed mushrooms and white wine sauce. We serve it with your choice of one side, bakery-fresh rolls, and our Soup, Salad & Fruit Bar. The seafood lover will enjoy this flaky sole fillet that’s lightly crusted with Parmesan breadcrumbs and drizzled with butter and fresh-squeezed lemon. It’s served with your choice of one side, bakery-fresh rolls, and Soup, Salad & Fruit Bar. A returning Italian classic! Enjoy our ziti baked with sliced Italian sausage, marinara sauce, and mozzarella cheese. It’s served with garlic toast and our Soup, Salad & Fruit Bar. We now have even more dishes that can be paired with our Soup, Salad & Fruit Bar for a special price… Introducing our Premium Salad Bar Dinner Deals! The perfect transition into fall for your taste buds, this dish features our 8 oz. boneless pork rib-eye, seasoned and slow-roasted in-house, then sliced and topped with our Dijon apple glaze. It’s served with our Soup, Salad & Fruit Bar, your choice of one side, and bakery-fresh rolls! Please make sure that people realize that the "bakery fresh rolls" which come with the Gluten-friendly Rosemary chicken are not themselves gluten-free and perhaps they could choose something else instead. Some people might assume that the rolls are gluten-free as well and eat them. Some people are so sensitive that even having the bread touch the rest of the meal can affect them. I'm glad that Eat ' n Park serves the rolls on a separate plate, but if they are brought to the table and not eaten, they must be thrown away. Thank you. I like Eat 'n Park, but their prices are getting too high for a family restaurant. I wish your resturant was a little bit more relaxng. Kids running around bright lights Nice soft music would be nice. Even your staff should slow down seems they want to feed you and get you out. Especially when your having the soup and salad, I think they bring you food real fact so you don't have time to enjoy the salad bar.Alson put the sald bar off to the side so there are not so many people walking by going to their seat or bathroom. (not very appetizing. The Eat'n' park in Pleasant Hills is a good example of what people would like. The salad bar is way off to he side and the only people that pass by are having the salad bar. Thank you all for your comments. We will make sure to pass along your feedback to our menu development and facilities teams! Please bring back the delicious bean soup and peanut butter pie from years ago.